As pleased as I was with Ticket to Ride Pocket, Days of Wonder’s mobile adaptation of its excellent board game, some shortcomings—lack of online play, for example—prevented it from achieving the same lofty heights as its iPad counterpart. The latest update to the iPhone version not only corrects that notable omission, but also adds one new feature that lets it pull ahead of the iPad version: asynchronous play. Take your turn: The updated version of Ticket to Ride Pocket supports asynchronous play, and lets you face off online via Game Center. Dubbed Multi Mode, the new feature lets you play multiple simultaneous games of Ticket to Ride Pocket—each with up to four friends—and switch freely between them, or even to other apps. Of course, this game style has been long established by games like Carcassonne and the popular Words with Friends, but its addition in Ticket to Ride is a welcome one. Quick as Ticket to Ride games are—they often take half an hour or less—sometimes you just don’t have that kind of time in a single sitting. Of course, since you’re unlikely to need to switch between different games against the people sitting in the same room as you, Multi Mode is far more useful in conjunction with the other major improvement to Ticket to Ride Pocket: Online play via Game Center. Now you can challenge your friends from all around the world to matches, and play whenever it’s most convenient for you. The update also sports improvements to Local Play between iPhone, iPod touch, and iPads over Wi-Fi and Bluetooth—those enhancements are included in a simultaneous update to the iPad version, too. One feature the iPad version won’t get in this update, though, is the new Multi Mode; Days of Wonder told me that there are, at present, some challenges to get it to work between the iPhone and iPad versions of the game. 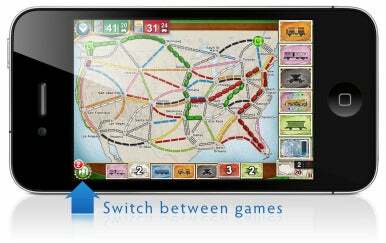 However, you will now be able to switch away from games on the iPad version without losing your place.